There have been multiple studies giving conflicting accounts on the complications and/or efficacy of rhBMP-2 in both off and on label use. ,,,,,,,,,,,,, Due to concern for soft tissue swelling and airway compromise in anterior cervical spine fusion with rhBMP-2, ,,,, the FDA recently issued a public health notification, prompting further scrutiny of off-label use of rhBMP-2. There are few reports on the use of rhBMP-2 in the posterior atlantoaxial and craniovertebral junction, ,, and these are primarily case reports. There is a lack of reports on the safety or efficacious dose of rh-BMP2 used in this region of the spine. Our objectives in the present study were to report our experience on the safety, efficacy, and dosing of rh-BMP2 used as an adjunction for arthrodesis for patients warranting posterior cervical instrumented fusion that included the occiput and/or atlantoaxial levels. We identified all patients of the senior author who had undergone posterior cervical instrumented fusion from August 2003 to March 2008 following approval by the University of Virginia Institutional Review Board. The study cohort was narrowed to those who had undergone posterior occipito-cervical and/or atlantoaxial fusions with the use of rh-BMP2. Patient demographics, indications for surgery, number of levels fused, and amount of rhBMP-2 used were extracted. Both inpatient and outpatient clinical records were reviewed, with particular assessment for any evidence of wound issues. Bony fusion at last follow-up was assessed based on review of anteroposterior and dynamic (neutral/flexion/extension) lateral radiographic imaging by two independent neuroradiologists. Fusion grade was based on the criteria described by Lenke et al. [Table 1]. 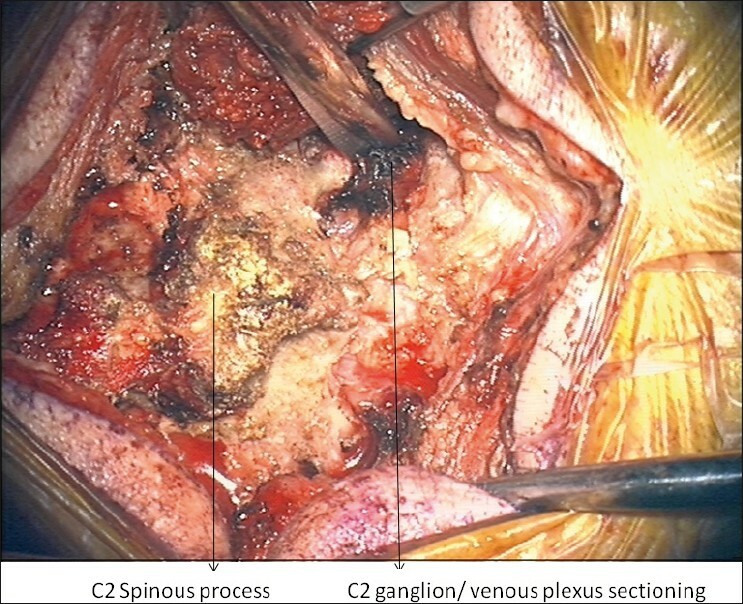 Figure 1: Intraoperative image of C2 nerve/ganglionectectomy following coagulation of nerve/venous plexus. Figure 2: Further decortication of C1-C2 joint following arthrodesis. In no case was structural bone graft used. In occiput to cervical spine fusions, rhBMP-2 soaked sponge was covered with morselized bone graft as an onlay spanning the fusion bed. All cases had two 1/8 th inch hemovac drains placed prior to closure, and these were left in place for an average of 2 days (range 1-6 days). Removal of drains required two consecutive 8-hour shifts of less than 30 cc of output. Use of instrumentation and rhBMP-2 as adjuncts for posterior craniovertebral and atlantoaxial cervical fusion are off-label uses of these products. We identified 28 patients with posterior craniovertebral junction and/or atlantoaxial instrumented arthrodesis over the time period via chart review. Five of those patients were not available for follow-up. One of the patients never returned for follow-up and provided inaccurate contact information following trauma admission. The other four patients were deceased more than a year after surgery from unrelated causes like: myocardial infarction, stroke, and kidney failure (x2). None of the patients lost to follow-up experienced an operative or peri-operative complication. [Table 2] describes the 23 patients (10 men and 13 women) available for follow-up. The average patient age was 60.9 years (standard deviation [SD] =27.4 years, range: 4-89 years). The gender breakdown, diagnosis and level of fusion with Lenke fusion grade is seen in [Table 1]. Specific pathological diagnosis for the 23 patients with follow-up is summarized in [Table 3]. [Figure 3] and [Figure 4] demonstrates an illustrative cases in which computed tomography (CT) was obtained during follow-up. Figure 3: A 52-year-old woman with severe rheumatoid arthritis and basilar invagination. She had previously undergone multiple prior cervical procedures done at another hospital, including placement of anterior interbody cages at C4-C6. She subsequently required occipital-cervical instrumented arthrodesis and decompression using rhBMP-2 and cancellous allograft for treatment of basilar invagination. Postoperative AP and lateral radiographs are shown in panels a and b, respectively. 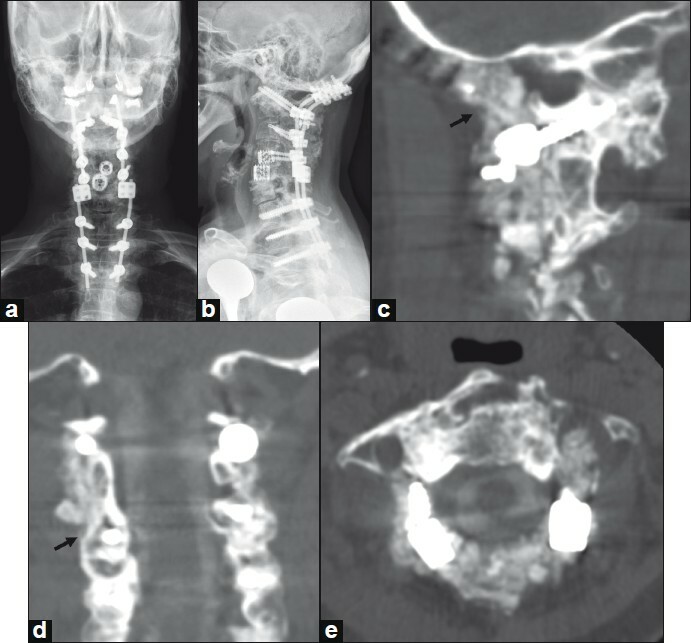 CT imaging with sagittal (panel c) and coronal reconstructions (panel d) performed 19 months following surgery demonstrates brisk bony fusion extending from the occipital to C1 (panel c, arrow) and along the lateral masses (panel d, arrow). Axial CT imaging at the interspace of C1-C2 does not demonstrate canal encroachment (panel e). Figure 4: A 78-year-old woman with nonunion of a Type II odontoid fracture. Preoperative CT imaging with sagittal reconstruction demonstrates a Type II odontoid fracture (panel a). Postoperative plain AP (panel b) and lateral (panel c) radiographs following C1-C2 instrumented arthrodesis with C1 lateral mass and C2 pedicle screws, rhBMP-2 and cancellous allograft. CT imaging with sagittal reconstructions at one-year follow-up demonstrates healing of the odonoid fracture (panel d, arrow) and brisk bony fusion (panels E and f, arrows). Axial CT imaging at the interspace of C1-C2 does not demonstrate canal encroachment (panel g). The average rhBMP-2 used per level fused with subsequent fusion grade is shown in [Table 4]. The average rhBMP-2 dose was 2.38 mg/level, with a total of 76 levels treated (average 3.3 levels, SD= 1.4 levels). By last follow-up, all patients had achieved solid fusion, with all but two patients having Lenke Grade A fusion. The use of rhBMP-2 in pediatric patients under 10 years occurred in 2 patients due to special circumstances. One was a 4-year-old with osteogenesis imperfecta who suffered a cervical fracture and a 9-year-old who presented with failed fusion with wires and iliac crest bone graft. The complications were assessed by reviewing both inpatient and outpatient charts. There were no cases of implant loosening or failure in any of the patients. All cases were evaluated for postoperative dysphagia or neck swelling requiring treatment (including steroids or reintubation). There were none found. In limited number of cases, in which routine follow-up included computed tomographic imaging, canal compromise from bony overgrowth was not identified. No patient reported discomfort with ganglionectomies performed based on direct assessment at clinical follow-up. Interest in performing this review study arose from the current conflicting reports of complications versus increased fusion rates in the use of rhBMP-2 for cervical and craniovertebral junction surgery. ,,,,,,,,,,, Reports have included painful seroma requiring return to the operating room for evacuation. There have also been reports of tissue swelling and airway compromise, particularly in the anterior cervical spine. ,,, The use of surgical wound drains in cases using osteoinductive products as adjuncts to fusion was not consistently documented in all patients in the above studies. Use of drains (left in place until output falls below 30 cc for 2 consecutive 8-hour shifts) in our practice greatly reduces the occurrence of painful seroma or swelling. In a report by Crawford et al. a 15% wound complications rate was reported with the use of rh-BMP2. This may be related to the routine postoperative day 2 removal of drains. It is also possible that it could relate to the dosage of rh-BMP2 used per level, which was twice as high as that used in the present study. In the present study, which included a high proportion of patients with significant risk factors for pseudoarthosis (e.g., rheumatoid arthritis), we achieved a 100% fusion rate without complications. In addition, we have documented and reported the dosage of rh-BMP2 used per level. The non-linear relationship between the milligrams of rhBMP-2 used per level is a limitation/constraint of dosage by packaging. We avoided the donor site morbidity ,, of iliac crest bone graft (ICBG) with rhBMp-2 augmented fusion. ICBG site infections and complications can be as high as 29% from the above studies. In comparing our series with a cohort of patients by Nockels,  who used ICBG in one-third of his patients (occipital-cervical fusion, n = 69), a 97% fusion rate was achieved with one donor site infection, while in our current series using rhBMP-2, 100% fusion rate was achieved without any donor site morbidity. The limitations of this study include the retrospective design. In addition, standardized measures were not used in assessing clinical outcomes. Flexion/extension and anterior-posterior plain radiographs were used for assessment of fusion as opposed to fine cut computed tomography. Although the latter has been shown to have a greater degree of interobserver and intraobserver agreement, Carreon et al. , have demonstrated that this difference is minimized when fusion is solid. However, an underestimation of pseudoarthrosis remains a possibility. 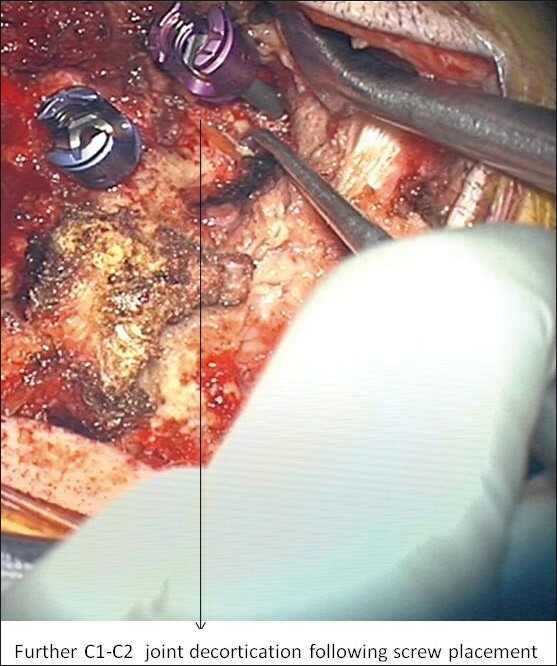 In augmenting posterior craniovertebral and atlantoaxial instrumented fusion with rhBMP-2, a 100% fusion rate was achieved in a series of patients with complex pathology and/or rheumatoid arthritis. From our data, a safe and effective average dose was found to be 2.38 mg per level. 1. Urist MR. Bone: formation by autoinduction. Science 1965;150:893-9. 2. Baskin DS, Ryan P, Sonntag V, Westmark R, Widmayer MA. 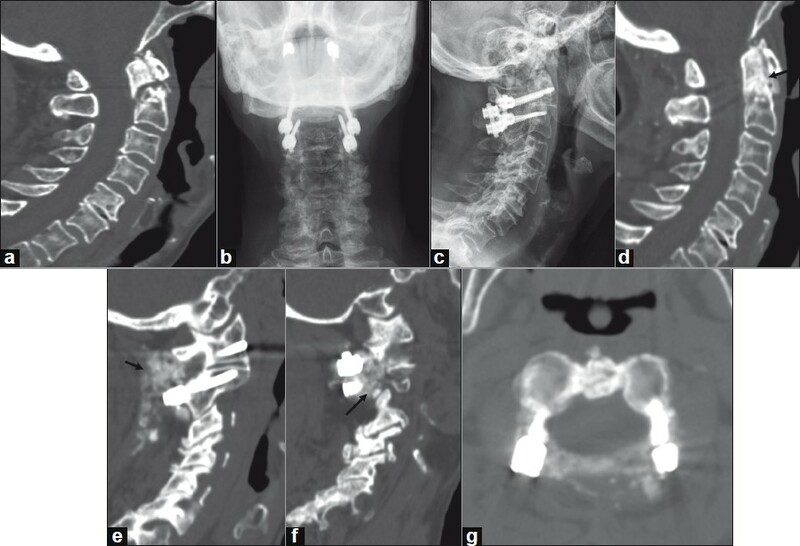 A prospective, randomized, controlled cervical fusion study using recombinant human bone morphogenetic protein-2 with the CORNERSTONE-SR allograft ring and the ATLANTIS anterior cervical plate. Spine (Phila Pa 1976) 2003;28:1219-24. 3. Cahill KS, Chi JH, Day A, Claus EB. Prevalence, complications, and hospital charges associated with use of bone-morphogenetic proteins in spinal fusion procedures. JAMA 2009;302:58-66. 4. Chen NF, Smith ZA, Stiner E, Armin S, Sheikh H, Khoo LT. Symptomatic ectopic bone formation after off-label use of recombinant human bone morphogenetic protein-2 in transforaminal lumbar interbody fusion. J Neurosurg Spine 2010;12:40-6. 5. Cimic M, Smoljanovic T, Bojanic I. Re: Hiremath GK, Steinmetz MP, Krishnaney AA. Is it safe to use recombinant human bone morphogenetic protein in posterior cervical fusion? Spine 2009;34:885-9. Spine (Phila Pa 1976) 2010;35:361. 6. Crawford CH 3rd, Carreon LY, McGinnis MD, Campbell MJ, Glassman SD. Perioperative complications of recombinant human bone morphogenetic protein-2 on an absorbable collagen sponge versus iliac crest bone graft for posterior cervical arthrodesis. Spine (Phila Pa 1976) 2009;34:1390-4. 7. Dickerman RD, Reynolds A, Tackett J, Morgan B, Bennett M. Bone morphogenic protein. J Neurosurg Spine 2008;9:401. 8. Dickerman RD, Reynolds AS, Morgan BC, Tompkins J, Cattorini J, Bennett M. Rh-BMP-2 can be used safely in the cervical spine: Dose and containment are the keys! Spine J. 2007 Jul-Aug;7(4):508-9. 9. Sekhon LH. Posterior cervical decompression and fusion for circumferential spondylotic cervical stenosis: review of 50 consecutive cases. J Clin Neurosci 2006;13:23-30. 10. Wong DA, Kumar A, Jatana S, Ghiselli G, Wong K. Neurologic impairment from ectopic bone in the lumbar canal: a potential complication of off-label PLIF/TLIF use of bone morphogenetic protein-2 (BMP-2). Spine J 2008;8:1011-8. 11. Shimer AL, Oner FC, Vaccaro AR. Spinal reconstruction and bone morphogenetic proteins: open questions. Injury 2009;40:S32-8. 12. Boden SD, Kang J, Sandhu H, Heller JG. Use of recombinant human bone morphogenetic protein-2 to achieve posterolateral lumbar spine fusion in humans: a prospective, randomized clinical pilot trial: 2002 Volvo Award in clinical studies. Spine (Phila Pa 1976) 2002;27:2662-73. 13. Boden SD, Zdeblick TA, Sandhu HS, Heim SE. The use of rhBMP-2 in interbody fusion cages. Definitive evidence of osteoinduction in humans: a preliminary report. Spine (Phila Pa 1976) 2000;25:376-81. 14. Carlisle E, Fischgrund JS. Bone morphogenetic proteins for spinal fusion. Spine J 2005;5:240S-9S. 15. Damien CJ, Grob D, Boden SD, Benedict JJ. Purified bovine BMP extract and collagen for spine arthrodesis: preclinical safety and efficacy. Spine (Phila Pa 1976) 2002;27:S50-8. 16. Glassman SD, Carreon L, Djurasovic M, Campbell MJ, Puno RM, Johnson JR, et al. Posterolateral lumbar spine fusion with INFUSE bone graft. Spine J 2007;7:44-9. 17. Haid RW Jr, Branch CL Jr, Alexander JT, Burkus JK. Posterior lumbar interbody fusion using recombinant human bone morphogenetic protein type 2 with cylindrical interbody cages. Spine J 2004;4:527-38. 18. Luhmann SJ, Bridwell KH, Cheng I, Imamura T, Lenke LG, Schootman M. Use of bone morphogenetic protein-2 for adult spinal deformity. Spine. 2005 Sep 1;30(17 Suppl):S110-7. 19. Singh K, Smucker JD, Gill S, Boden SD. Use of recombinant human bone morphogenetic protein-2 as an adjunct in posterolateral lumbar spine fusion: a prospective CT-scan analysis at one and two years. J Spinal Disord Tech 2006;19:416-23. 20. Zlotolow DA, Vaccaro AR, Salamon ML, Albert TJ. The role of human bone morphogenetic proteins in spinal fusion. J Am Acad Orthop Surg 2000;8:3-9. 21. Hamilton DK, Jones-Quaidoo SM, Sansur C, Shaffrey CI, Oskouian R, Jane JA Sr. Outcomes of bone morphogenetic protein-2 in mature adults: posterolateral non-instrument-assisted lumbar decompression and fusion. Surg Neurol 2008;69:457-61. 22. New device approval july 2 2002 [homepage on the Internet]. United States Food and Drug Administration. Available from: http://www.fda.gov/cdrh/mda/docs/p000058.pdf. [last accessed on 2009 Jun 29]. 23. Graham JJ. Complications of cervical spine surgery. A five-year report on a survey of the membership of the Cervical Spine Research Society by the Morbidity and Mortality Committee. Spine (Phila Pa 1976) 1989;14:1046-50. 24. McClellan JW, Mulconrey DS, Forbes RJ, Fullmer N. Vertebral bone resorption after transforaminal lumbar interbody fusion with bone morphogenetic protein (rhBMP-2). J Spinal Disord Tech 2006;19:483-6. 25. Mindea SA, Shih P, Song JK. Recombinant human bone morphogenetic protein-2-induced radiculitis in elective minimally invasive transforaminal lumbar interbody fusions: a series review. Spine (Phila Pa 1976) 2009;34:1480-4. 26. Hiremath GK, Steinmetz MP, Krishnaney AA. Is it safe to use recombinant human bone morphogenetic protein in posterior cervical fusion? Spine (Phila Pa 1976) 2009;34:885-9. 27. Shahlaie K, Kim KD. Occipitocervical fusion using recombinant human bone morphogenetic protein-2: adverse effects due to tissue swelling and seroma. Spine (Phila Pa 1976) 2008;33:2361-6. 28. Fahim DK, Whitehead WE, Curry DJ, Dauser RC, Luerssen TG, Jea A. Routine use of recombinant human bone morphogenetic protein-2 in posterior fusions of the pediatric spine: safety profile and efficacy in the early postoperative period. Neurosurgery 2010;67:1195-204. 29. Robin BN, Chaput CD, Zeitouni S, Rahm MD, Zerris VA, Sampson HW. Cytokine-mediated inflammatory reaction following posterior cervical decompression and fusion associated with recombinant human bone morphogenetic protein-2: a case study. Spine (Phila Pa 1976) 2010;35:E1350-4. 30. Unnanantana A. Posterolateral lumbar fusion for degenerative spondylolisthesis: experiences of a modified technique without instrumentation. J Med Assoc Thai 1997;80:570-4. 31. Shields LB, Raque GH, Glassman SD, Campbell M, Vitaz T, Harpring J, et al. Adverse effects associated with high-dose recombinant human bone morphogenetic protein-2 use in anterior cervical spine fusion. Spine (Phila Pa 1976) 2006;31:542-7. 32. Smucker JD, Rhee JM, Singh K, Yoon ST, Heller JG. Increased swelling complications associated with off-label usage of rhBMP-2 in the anterior cervical spine. Spine (Phila Pa 1976) 2006;31:2813-9. 33. Tumialan LM, Pan J, Rodts GE, Mummaneni PV. The safety and efficacy of anterior cervical discectomy and fusion with polyetheretherketone spacer and recombinant human bone morphogenetic protein-2: a review of 200 patients. J Neurosurg Spine 2008;8:529-35. 34. FDA public health notification: Life-threatnening complications associated with recombinant human bone morphogenetic protein in cervical spine fusion. [homepage on the Internet]. Available from: http://www.fda.gov/crdh/safety/070108-rhbmp.pdf. 2008. 35. Lenke LG, Bridwell KH, Bullis D, Betz RR, Baldus C, Schoenecker PL. Results of in situ fusion for isthmic spondylolisthesis. J Spinal Disord 1992;5:433-42. 36. Allen RT, Lee YP, Stimson E, Garfin SR. Bone morphogenetic protein-2 (BMP-2) in the treatment of pyogenic vertebral osteomyelitis. Spine (Phila Pa 1976) 2007;32:2996-3006. 37. Oluigbo CO, Solanki GA. Use of recombinant human bone morphogenetic protein-2 to enhance posterior cervical spine fusion at 2 years of age: technical note. Pediatr Neurosurg 2008;44:393-6. 38. Goel A, Desai KI, Muzumdar DP. Atlantoaxial fixation using plate and screw method: a report of 160 treated patients. Neurosurgery 2002;51:1351-6. 39. Goel A. Atlantoaxial instability. J Neurosurg Spine 2004;1:347. 40. Goel A, Laheri VK. Plate and screw fixation for atlanto-axial dislocation. (Technical report). Acta Neurochir (Wien) 1994; 129:47-53. 41. Garrett MP, Kakarla UK, Porter RW, Sonntag VK. Formation of painful seroma and edema after the use of recombinant human bone morphogenetic protein-2 in posterolateral lumbar spine fusions. Neurosurgery 2010;66:1044-9. 42. Vaidya R, Sethi A, Bartol S, Jacobson M, Coe C, Craig JG. Complications in the use of rhBMP-2 in PEEK cages for interbody spinal fusions. J Spinal Disord Tech 2008;21:557-62. 43. Hamilton DK, Smith JS, Sansur CA, Dumont AS, Shaffrey CI. C2 neurectomy during atlanto-axial instrumented fusion in the elderly: Patient satisfaction and surgical outcomes. J Neurosurg Spine 2010 [In Press]. 44. Silber JS, Anderson DG, Daffner SD, Brislin BT, Leland JM, Hilibrand AS, et al. Donor site morbidity after anterior iliac crest bone harvest for single-level anterior cervical discectomy and fusion. Spine (Phila Pa 1976) 2003;28:134-9. 45. Younger EM, Chapman MW. Morbidity at bone graft donor sites. J Orthop Trauma 1989;3:192-5. 46. Nockels RP, Shaffrey CI, Kanter AS, Azeem S, York JE. Occipitocervical fusion with rigid internal fixation: long-term follow-up data in 69 patients. J Neurosurg Spine 2007;7:117-23. 47. Carreon LY, Djurasovic M, Glassman SD, Sailer P. Diagnostic accuracy and reliability of fine-cut CT scans with reconstructions to determine the status of an instrumented posterolateral fusion with surgical exploration as reference standard. Spine (Phila Pa 1976) 2007;32:892-5. 48. Carreon LY, Glassman SD, Djurasovic M. Reliability and agreement between fine-cut CT scans and plain radiography in the evaluation of posterolateral fusions. Spine J 2007;7:39-43.